Tech giant IBM is aiming to revamp the healthcare sector using blockchain technology. The IT veteran recently partnered with a consortium of healthcare enterprises, including American healthcare insurance giant Aetna, to build the Health Utility Network. The goal of the Health Utility Network is to enable healthcare companies to build, share and deploy solutions that could drive digital transformation in the space. Why does the healthcare sector of all industry segments need blockchain you ask? Even though the healthcare industry has gone through unprecedented levels of modernization over the years (with surgeons now being able to remotely conduct surgery-via a dexterous robot -that maintains a connection through a 5G network), the industry has found it cumbersome to digitize healthcare information, increase interoperability and improve transparency despite major initiatives to do otherwise. These inefficiencies are inadvertently costing the industry as much as 50 cents on the dollar, which if rectified could significantly boost the profitability of healthcare organizations. This is where blockchain could prove useful for the healthcare industry and what companies like IBM are aiming to bring into the industry. But IBM is not alone. Numerous startups have also realized the potential for blockchain technology in the healthcare sector and they have collectively managed to attract a staggering $246 million to date (source). A breakdown of the funds raised gives a clear idea of the leading players in the space. Startups like Shivom.io and Solve.care together attracted as much as 27% of the total funds invested in the blockchain-healthcare space, indicating that these startups exhibit great promise and investors are willing to pledge top-dollar in their business. 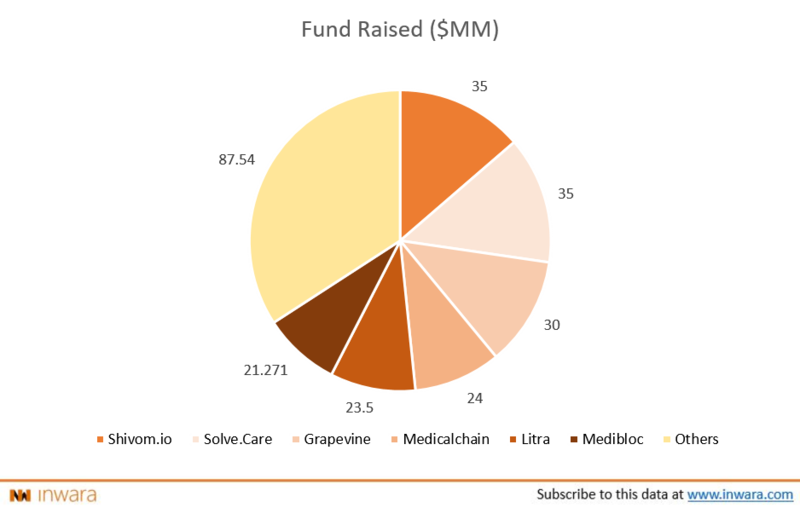 Startups like Grapevine, Medicalchain and Litra are not far behind the top players and also raised significant funds. Interestingly, the top five companies attracted a staggering 57% of the investments in the blockchain-healthcare space, indicating these players are far ahead of the competition. So what are the ways blockchain could revamp the healthcare industry? Before we dive into that, it’s important to understand what blockchain is. Decentralized- A blockchain network is not governed by a single authority but instead hands control to each computer (node) on its network. 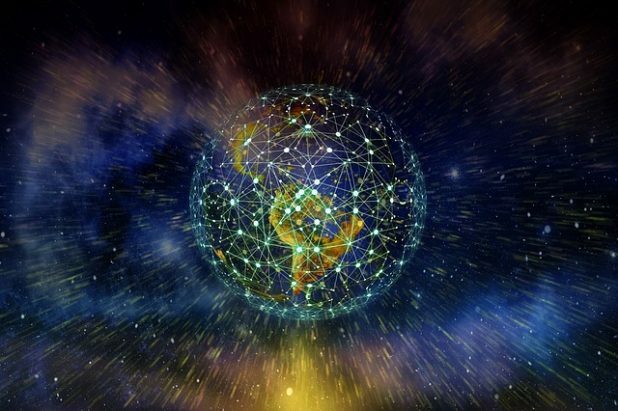 Distributed- blockchain is distributed because instead of a single computer providing all the computational power needed, a network of nodes work with each other to achieve the task. Cryptography- It’s the practice and study of techniques that enable secure communications in the presence of a third party. Secure communications is often achieved using encryption, similar to how whatsapp has an end-to-end encryption option. The innovation that blockchain brings to the table can be near perfectly summed up in the three words noted above. Blockchain allows data to be distributed but not copied, meaning it is immutable. Now a good analogy to explain how blockchain works is by imagining that blockchain is a digital spreadsheet that is copied thousands of times across a network of nodes. These nodes are constantly communicating with each other and are programmed to regularly update the spreadsheet. This means that data stored on a blockchain is by design resistant to manipulation, on top of being significantly more secure because of its decentralized nature and also because of the cryptographic techniques employed. And a blockchain network can do all this without the need for a central authority constantly managing it. Now let’s dive into the use cases of blockchain in the healthcare industry, that could potentially revamp the sector. In the healthcare industry, patient data is critical for doctors to properly diagnose diseases but the challenge is how this data is stored and shared. As you can imagine, sensitive patient data is stored on centralized servers which itself poses a huge security risk. Doctors often have to share sensitive data with other doctors possibly across borders and this is often achieved using traditional messaging platforms, which again are at risk of cyber attacks. Blockchain can be used to create a secure patient data management system. This is how healthcare managers can collect individual data from each patient which can then be stored on a private blockchain network. This step alone significantly decreases the security risk involved with data falling into the wrong hands since hacking into a blockchain network is incredibly difficult. In the healthcare industry, clinical trials are meant to gauge the tolerance and effectiveness of a product on a study group in order to come to a suitable conclusion. The conclusion is critical in determining the future of the product in the industry, which often takes billions to develop. As these trials take years to complete and include data from hundreds of patients and thousands of data points, most often errors are made along the way. These errors often change the outcome of the trial, which has led to some trials being manipulated by bad actors in the space to thwart progress. As mentioned earlier, blockchain is an immutable record, meaning once data is stored on a particular blockchain it cannot be manipulated, thus providing authentic proof for the conclusion at the end of the trials. The only way to change information on a blockchain network would be to gain control over a majority of nodes on the network, referred to as a 51% attack. This is incredibly hard to do on large networks with several hundred nodes. As the healthcare industry slowly starts digitization of patient information, it holds the potential to radically change how diseases are treated. Heard of big data analytics? Yes, it’s used by businesses to increase efficiency, but the same technology can be used to draw insights from patient records. Enterprises that employ big data analytics often use machine learning algorithms to draw meaningful insights from the slew of data available. But again the problem boils down to how to store patient data in a secure way but that is still accessible to machine learning algorithms. As it turns out, blockchain could be a viable solution due to its security and distributed characteristics, which can keep hackers at bay while at the same time allowing certain trusted users access. Imagine, a machine learning algorithm ploughs through all the patient data available and draws a parallel between lung cancer and smoking (or something more audacious that is not known to doctors). It could kick start a new era of medicine where instead of treating the symptoms, the focus shifts to the underlying causes. You may be surprised to know that drug counterfeiting is a huge problem in the healthcare industry, especially in developing countries where people often can’t afford expensive medicines. Astonishingly, anywhere between 10-30% of drugs sold in developing countries are counterfeit and this shady market is worth a staggering $20 billion annually. These drugs can be incredibly harmful to patients who consume them as they often contain abnormal ingredient levels. Blockchain can help ensure the authenticity of these drugs by integrating them into the supply chain network. Each batch of the drug made can be tracked at each stage of the manufacturing process which can help increase accountability in the space and curb bad actors in the space. With tech giants like IBM partnering with healthcare companies to introduce blockchain, it’s not too far fetched to expect major changes within the next few years. But just to be clear, Blockchain is not the panacea for all the problems plaguing the healthcare industry. It does, however, come close. As an engineer, Gregory has always been passionate about technology and is well versed in its applications. His current passion? Blockchain technology and its use cases. When not researching about technology, Gregory loves taking a swim, reading fictional pieces and is an avid melophile.